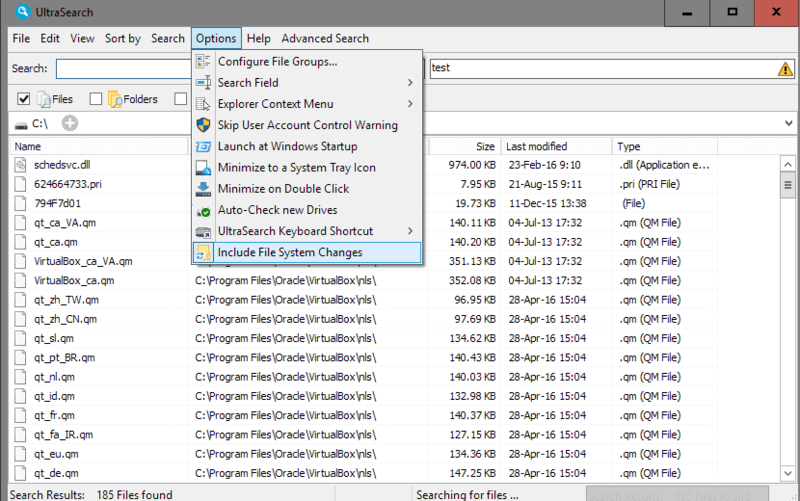 The new version of the file search program UltraSearch 2.1 for Windows introduces file content search among many other changes and fixes. 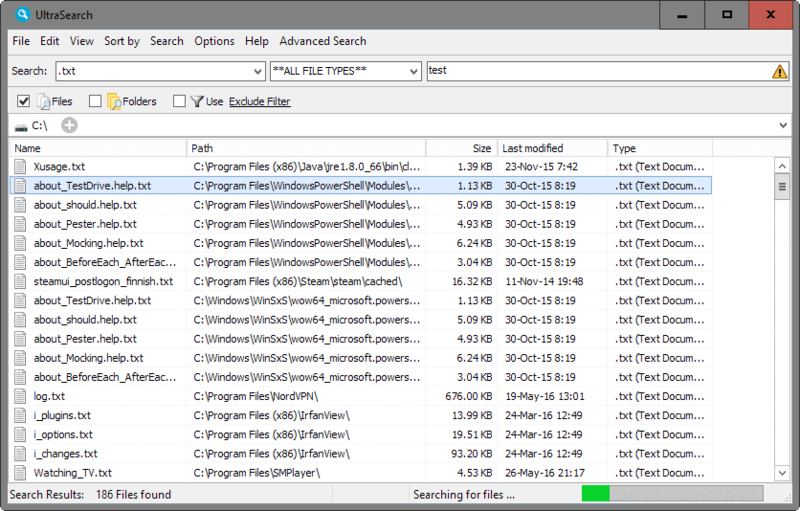 UltrasSearch 2.1 is the first major update of the free file search program for Windows for over a year. The program is one of those ultra-fast third-party search programs that use the Master File Table (MFT) to find matching files quickly. This leads to near-instant results once you start typing file names, extensions, or a combination thereof in the search field. We have featured the program in our free desktop search programs overview for Windows, and reviewed the application back in 2010. The major new feature of UltraSearch 2.1 is file content search. Instead of just returning files by name or extension, it is now possible to have UltraSearch scan files for characters you are interested in. Want a list of all files on a hard drive that mention your name, credit card number or other data? Then this is the way to get results quickly. UltraSearch 2.1 displays a warning when you run file content searches, and suggests you combine those with other data to speed up the process. The reason is simple: if you just search for content, all files on the hard drive will be searched which may take a long time even if the drive is fast. If you combine the in-content search with other data, a partial file name or extension, then less files need to be scanned for the text you are interested in. Simply type text you are interested in under "search for file content" near the top. UltraSearch picks it up automatically, scans all files matching the search rules, and displays them in a list afterwards. File content search is not limited to plain text file types such as .txt, .php or .css only, but includes binary file types as well. Search is slower when you use the new content search option, but it is still considerably fast. It took never longer than a couple of seconds to display a first batch of results. While the actual scanning may take longer, you may go through the results already. The list of changes on the official UltraSearch project website is long. While some of them may affect only some users, others are useful or at least nice to have for all. Jam Software, the company responsible for the search program, have removed the advertising banner from the program. There is however a new "advanced search" menu option which links to the company's TreeSize program in various ways. TreeSize is available as a free and commercial program. UltraSearch 2.1 is a big update for the desktop search program that brings along with it a major new feature. This makes the search program even better than it was before, and may convince users who did not use before to give it a try. Now You: which desktop search program do you use on Windows? I’ve been using Agent Ransack for a couple of years. Just done a few tests with UltraSearch 2.1 and it’s speed is very impressive in comparison. Also, it allows you to include folders that match the search pattern, which I couldn’t find a way to do with Ransack. Hardly found anything usable. I use the search within Far Manager. Is the tool in the article any faster than microsoft evil explorer? This one needs to be installed with Admin rights, if you want Context Menu Integration. Jam makes good stuff. Treesize is a great utility. Missing preview of found text but otherwise is still a good program. I’ve been using Ultrasearch for quite a while, and my only complaint was that it wouldn’t search file content. Now that function has been added, it’s about perfect. Does anyone know of a tool that can search the tags of video files? Update: (replying to my own reply) I actually found what I was looking for and so far it seems pretty good. http://www.jam-software.com/ultrasearch/manual.php and thus is easy to resize to my liking. I am very impressed by UltraSearch. It is really fast and the GUI is simple and clear. @chesscanoe: You can resize the included help (chm file) with Ctrl + mouse wheel. Thanks for the Ctrl + mouse wheel tip. This worked after I disabled (and subsequently deleted) a Chrome extension I didn’t like anyway. Thank you and for your time. I’m happy with Locate32 (http://locate32.cogit.net/); works on all flavors of Windows from XP to 10. Addendum: clicked submit, but my message diden’t appear. If it ends in a double post, please delete one of them.